It was a simple plan, born out of sadness from the never-ending news of a broken world. Feeling increasingly defeated by page after page of heart-wrenching articles, I decided to spread some joy. I would take those sad stories and turn them into beautiful heart-shaped, paper maché valentines for my loved ones. I mixed my paper paste, ripped out the articles and molded them into perfectly flat, perfectly symmetrical Valentine’s Day hearts. I silenced a tiny doubt in my mind that they were too thin to dry properly and happily placed them in front of the fire. Almost immediately, the edges began to curl and the middle began to warp. I scrambled to try to flatten them under the weight of heavy books- but to no avail. Those hearts were going to do what they wanted. All I could do was watch as they crinkled and shifted shape in the heat. I was left with bumpy, misshapen hearts that looked nothing like the perfect valentine I had envisioned. Discouraged, I gathered them together and stuck them on a shelf in my studio, hidden from view. Yet, everyday my ragged hearts called to me asking for a second chance at beauty. I finally gave in and pulled them out to play. This time, through the eyes of love instead of failure, I saw their potential. I smiled when I realized the heat of the fire had caused their shapes to shift gradually without cracking, allowing them to settle into their own unique beauty. Yes, they were warped and wrinkled and looked differently than I had hoped, but they were strong and whole; sturdy yet soft. As I began to layer them with paint, I noticed that each bump and wrinkle captured the colors beautifully, showing subtle texture, greater depth and movement. I saw that the curve of the middle added to their charm. How their unique imperfections gave them character and their lack of symmetry made them authentic. As I painted, words began to come to mind; hopeful, kind, generous, fierce, genuine, tender, strong, courageous, gentle, free-spirited, wise, brave. 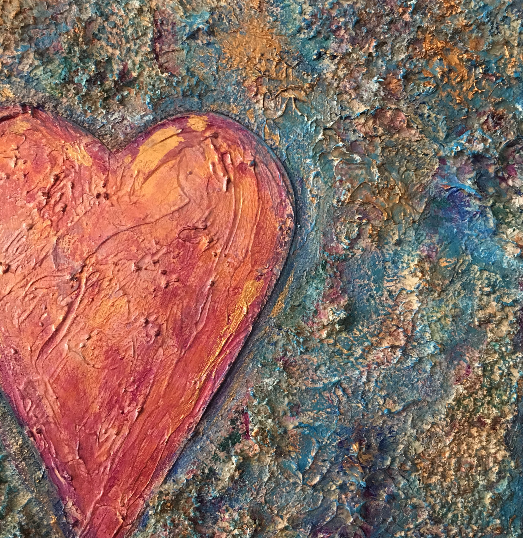 I realized these are the words I use to describe my most treasured people, and those beat up paper maché hearts began to take on a new, more powerful meaning. I thought about people in my life whose hearts are uniquely precious. They belong to those who have faced the fires of life with tremendous courage and have not allowed themselves to permanently crack or become hardened with bitterness or self- pity. Instead they willingly gave permission to be shaped into something newly magical. They are my friends who have faced grave illness and now have a fierce desire for intentional living and authenticity. They are my dear ones who have been wounded through injustice and prejudice who continue to show tremendous patience and kindness towards others. They are those who have been generously forgiven who, in turn, extend perfect mercy and they are those in deep grief who are now grateful for the gift of every day. They are families with limited resources who are the most generous and whose difficult times taught them great wisdom. They are adults whose childhood struggles rendered a tender heart for the downtrodden and they are young adults who fight anxiety and uncertainty to make a difference daily. And they are my precious ones, those gifted with sensitivity beyond measure, who feel crushed by the weighted wounds of the world, yet fiercely show up day after day to fight injustice and advocate for the marginalized and persecuted. As I look at this ragged group of paper hearts and celebrate the people who come to mind, I am struck with the idea that perhaps the bravest thing we can do in this world is to fight the urge to let it harden our hearts and make us indifferent to the pain around us. Rather we soak up the fires of life, yield to them and allow them to change us. Finally, we settle comfortably into our selves- proud of those perfect imperfections that allow us to view the hurts and struggles of our neighbors with compassion and empathy. Then as our hearts become stronger yet soft, humbled but fierce, we begin to fix our broken world. I originially wrote this as a guest post on my dear friend Kelly Ivy Johnson's beautiful blog. I encourage you to visit it for more uplifting stories.